During Blu-Ray supplement "Kon-Tiki: The Incredible True Story," the directors, actors and consultants talk endlessly about the importance of questioning authority and challenging the status quo. As asserted by them, Thor Heyerdahl's (Pål Sverre Hagen) quest to prove that Peruvians could have settled in Polynesia in pre-Columbian times — constructing a wooden raft and sailing across the Pacific Ocean in 1947 — was a representation of the sort of discernment and strength of mind that started the Copernican Revolution. Oddly, despite this behind-the-scenes assertion, Kon-Tiki opens with the flashback narrative framework of Thor as a child. Ignoring the warnings of adults and classmates alike, he hops across a frozen pond to collect a saw, falling into the water as everyone predicted. When his mother chastises him, asking if he's learned his lesson, he stares out the window wide-eyed, seemingly enthralled that this reckless act earned him the attention of his classmates. This introduction of a potential character contradiction, taking an exceedingly formulaic, incredible journey adventure and suggesting that those who make great discoveries (not all of which are for the betterment of humankind) tend to be megalomaniacal narcissists, is the only interesting thing about this standard tale of persistence. Though Thor's tenacity, doggedly weaving around every roadblock and flippant dismissal of his thesis — one stemming from an observation made by wife Liv (Agnes Kittelsen) — is what ultimately makes him succeed in assembling the crew and funds necessary to travel by raft across the Pacific Ocean, it's also what ultimately leaves him celebrating alone. 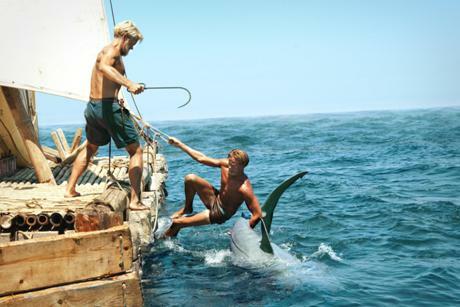 Before Kon-Tiki decides to complicate its thematic focus, the reliance is very much on generalized, survivalist melodrama. After the protracted introduction runs through the politics associated with embarking upon this mission, drawing characters as mere archetypes defined by singular attributes (sea-sickness, pudginess and the ownership of a parrot, to name a few), the trip unfolds as expected. Though composed beautifully by Geir Hartly Andreassen's cinematography, which captures the expansive ocean, wide-open blue-skies and sun-speckled open water glossiness, the minor disagreements and battles with inclement weather and the occasional shark don't break new ground. The technical elements of all the situations are effective — tension builds and the edits speed up to heighten audience investment — but since the narrative tropes are so blandly traditionalist and the characters interchangeable, blonde ciphers, it's difficult to connect. Worse is that the secondary introduction of the core thematic vein — defying authority — contradicts itself when Herman (Anders Baasmo Christiansen) challenges Thor, demanding he reinforce the raft with modern equipment after Herman proves it's taking on water and gradually rotting. Had this act, reiterating Thor's similar refusal to obey social order, succeeded in saving the crew, it might have helped reinforce the irresponsibility of the central purpose of the film. Instead, it acts as yet another roadblock that Thor has to overcome in order to make his dream, and mission statement, come true, making Kon-Tiki less a movie about challenging the status quo than a celebration of male solipsism and stubbornness in arbitrary rightness.